Like Gaudí in Barcelona, Nieto captured the spirit of a city and immortalised it in brick and mortar. Europe or Africa? I would call Melilla "Moderniste." 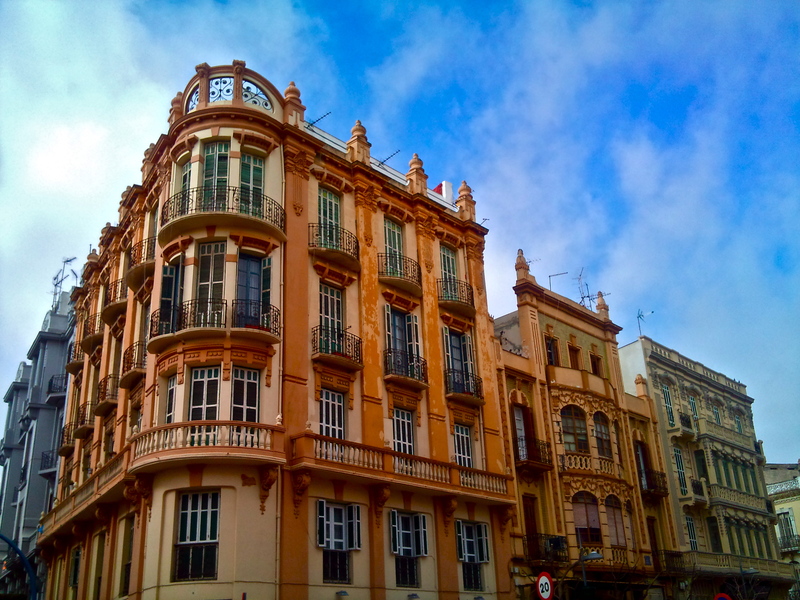 Still dizzy from the tiny propeller plane's bumpy descent, I finally find myself at the base of "La Reconquista," Melilla's finest example of Art Nouveau architecture, which has sparked my interest to visit this forgotten city. 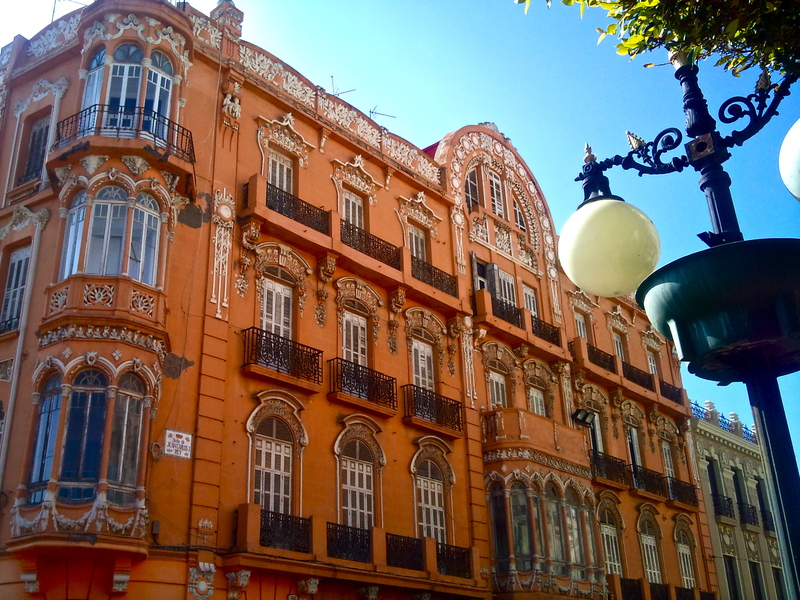 My eyes wander up the organic forms mimicking flowers and tendrils that curve the pastel façade, leading me on towards the red pinecone turrets, towering above the palm and orange trees, which punctuate Melilla's wide boulevards. An old car puffs out a trail of black smoke in passing, leaving behind the smell of benzene. Animated dialogue in Tarifit, a northern Berber dialect, wafts out of the balcony above me, reminding me where I am. Melilla might be one of Spain's most celebrated modernist cities -- but it's the only one in North Africa. 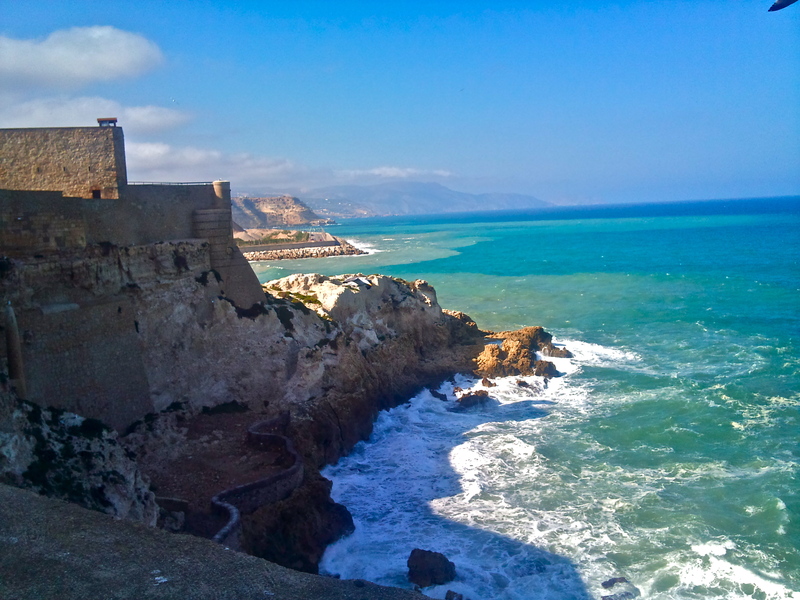 This autonomous city is a Spanish exclave, which along with the city of Ceuta near Tangiers, marks the only EU territory on the African Continent. Founded as a Phoenician settlement around the 7th century BC, Melilla passed into Spanish hands at the end of the 1400s. Echoes of its medieval history envelop the peninsula of the old town, bordered by sea-sculpted rocks and the foaming swell of the Mediterranean. Yet further inland, Melilla's modernist character peers back through the wrought-iron balconies of its townhouses and ornate flaking plasterwork, eroded by a century's worth of briny damp. Capturing the spirit of modernity and innovation, quadratic lines of the new city blocks and wide boulevards grew out from the base of the fortified old town. Military engineers from the Guadalajara Academy in Spain mapped out the streets, where they merged eclectic design with classical architecture, characterised by sober and elegant lines. However, the arrival of Catalan architect Enric Nieto turned the city into a garden of Art Nouveau forms and avant-garde proportions. In Barcelona, Nieto moved among the great Catalan architects, studying under Domènech i Montaner and collaborating with Antoni Gaudí on La Pedrera (Casa Milà) in 1906, only to leave immediately for Melilla in 1909. So how did this Catalan architect come to North Africa? Nieto's love for a Catalan woman, Josepa Ribas, whose father had been an owner of several bars in Melilla, was enough to uproot the architect from his Barcelona home, to cross continents and be with the woman he eventually married in 1911. In 1931, Nieto rose to the position of City Architect after bringing the gospel of Catalan Modernisme to the African continent, and thus turning Melilla into Spain's most important Art Nouveau centre after Barcelona and Valencia. The central district known as the "Golden Triangle" concentrates the majority of the city's 148 listed modernist buildings, so I begin my search for Nieto's Melilla from the Plaza de España. Peeking behind the palm trees of the tropical traffic island in the Plaza, house number one on Avenida de Juan Carlos I (formally known as Avenida del Generalísimo, named after Franco) comes into view, adorned with arched floral ornamentation on the semi-circular attic window. Built by Enric Nieto in 1915, the soft natural forms and elaborate details take me back to Lluís Domènech i Montaner's Casa Lleó Morera in Barcelona's famous Illa de la Discòrdia on the Passaig de Gràcia. With the salmon-pink façade set against the blue sky, for a moment I feel like I'm in Catalonia, until old men in kaftans pass by, trying to sell genuine-fake watches to the Spanish residents in the nearby bar. I follow the avenue up to the Plaza Menéndez y Pelayo and "La Reconquista." The extension carried out by Nieto in 1915 features intricate iron- and plaster-work depicting floral motifs and female faces. Two pinecone shaped turrets crown the roof, decorated with dark orange ceramic "scales." 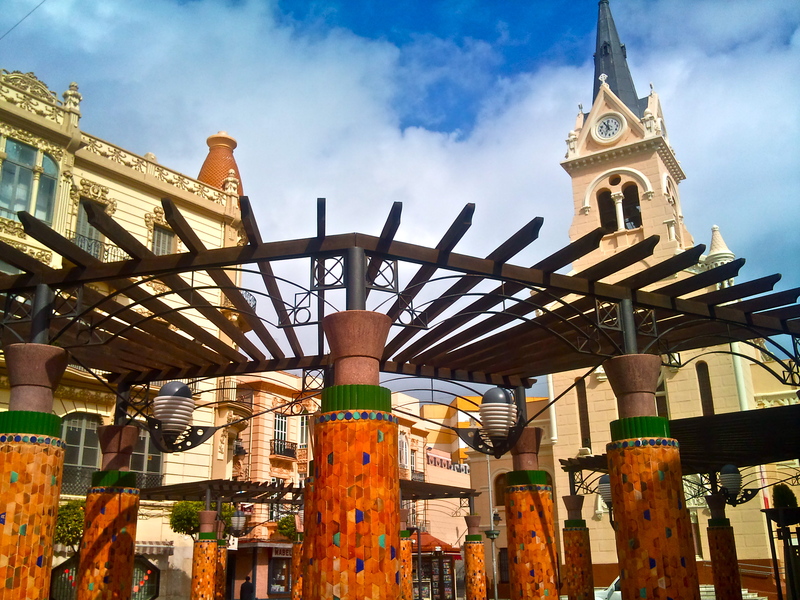 The "La Reconquista" department store extension combines French Art Nouveau, reflected in its feminine and floral references, Viennese Secession details, and bold Catalan Modernisme, where the scaly rooftops and colorful mosaic columns echo Gaudí's works. The scent of citrus fruits wafts from the orange trees dotted around the square, and the color of its ripe fruit complements the mosaic's warm tones. The Golden Triangle ends at the corner of García Cabrelles and Avenida de los Reyes Católicos, with "El Acueducto", built in 1928. Enric Nieto's style began to evolve in the 1920s, moving away from eclectic blends of Art Nouveau to create his own interpretations. The building is coloured in a mix of cream and pastel orange, topped with a tiara-shaped balcony decorated with ironwork of spiralling flowers. The sound of Islamic call to prayer crackles through the megaphone and the clang of church bells complement each other as the sun sets over the mountains of Morocco beyond the border. 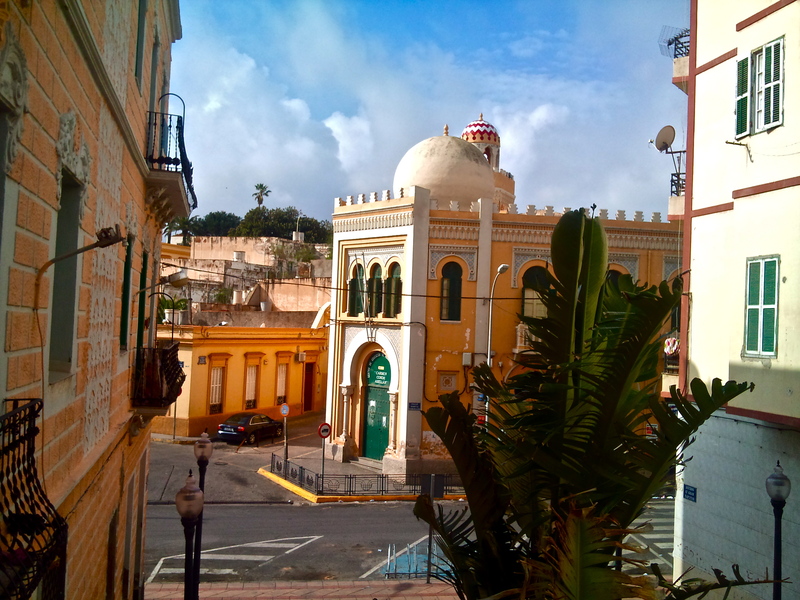 Melilla is known as the "City of Four Cultures" with its mix of Christians, Muslims, Jews and the modern Hindu population coexisting in the community. When Melilla became a free port at the end of the 19th century, many Indians came to the city to set up trade, but now, the population is reduced to about 100 Hindus. The Hindu Oratory on Calle Castelar is the community's religious and cultural focal point. Unlike the Mosque, the many Churches and the Synagogue, the Hindu Oratory blends into the background, hidden inside an old town house. I walk past it many times, using the map for reference before asking a passerby about its location. 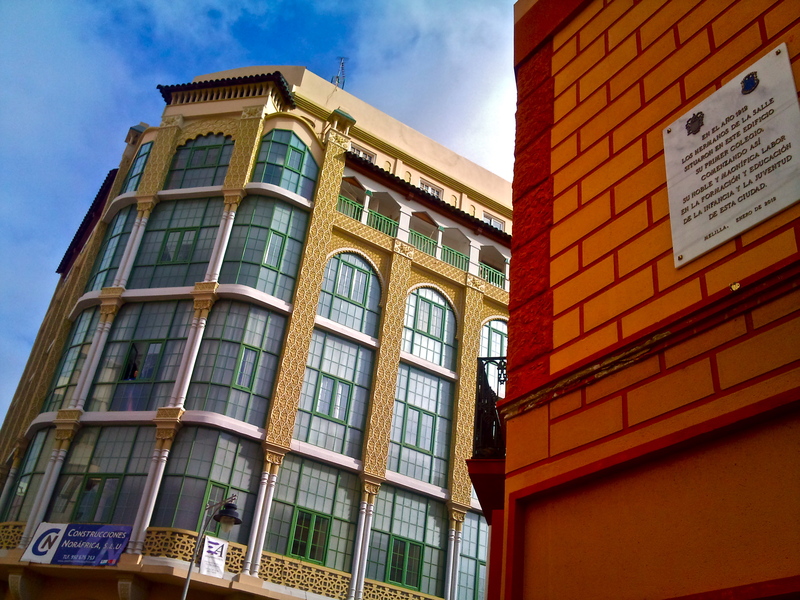 However, Melilla's Modernisme influenced the other religious buildings in the city, and Nieto's flamboyant accent marks both the Mosque in Calle García Cabrelles (1945) and the "Or Zoruah" Synagogue in Calle Lopéz Moreno (1924). Through Nieto's design, an architectural thread bonds the cultures closer together in this European city located only 60 miles down the coast from the Algerian border. Architecture became a mirror of the city's culture, where modernist innovation merged with Arab calligraphies of the Caliphate, the Nasrid and the Marinid motifs, as in the "Casa de los Cristales" (the Glass House) on General Prim Street number 18. During the day, the light bounces off the mosaic design of these windows and I try to take a photo discretely as an old woman pokes her head out, glaring at me as I point my camera. The clinking glasses and the smell of fried fish call me into La Cervecería on the neighbouring Calle General O'Donnell. The décor of aquamarine mosaics is a tribute to Gaudí's Casa Batlló. 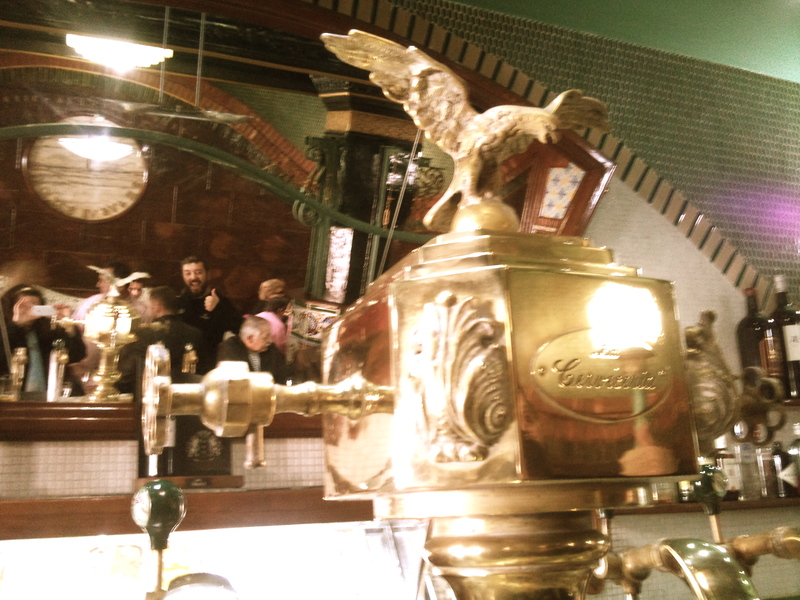 Chrome taps pipe beer out into curved glasses and the middle aged couple next to me dig into plates of tapas. The bar moves with the tide of bodies reaching out to grab the bartenders' attention, as the crowd gesticulate in Castilian Spanish. The food is typical Iberian, but I taste Melilla's melting pot in the paella set down in front of me, spiced with Moroccan ras-el-hanout. Melilla embraces its dual identity. It has adapted and altered aspects both from Moroccan and Spanish culture. Even Nieto moved away from his Barcelona roots, morphing over the decade into the geometric lines of Art Deco. Nieto played with a number of designs and styles, continually experimenting into the 1940s before his death in 1954, and so paving the way for other avant-garde architects who continued to shape Melilla.